Spring is busting out all over the valley. Loads of fresh plants and Perennials are arriving daily. We have all of our new spring collections of outdoor furniture on our floor with Hundreds of sunbrella fabric umbrellas for you to choose from. Also we carry all the new varieties of plants for new additions for your gardens. 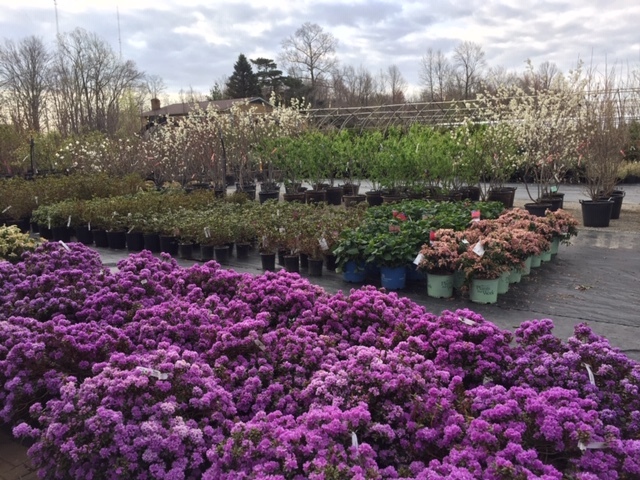 Whether you are looking for a few plants to fill in a neglected area or a total makeover Kushner's is the one stop place for all of your outdoor needs. Starting with paving materials for the floor of your outdoor room, you can select from a large assortment of natural stone products or for some of the finest man made materials from UniLock large selection of shapes and colors. After completing your paving project let us help with your plantings, if you need assistance making a decision on what to put where. Our staff can provide plenty of answers on the different types of plants and there uses for Youngstown area. You can also elect to let us assist with our Computer rendering with a picture of your home, we can take plants and place them in the photo for a total visual planting plan, so that you can see planting in advance. You can choose from the largest plant selection in the TRI County area from out favorites to the newest Varieties!!! With all this done now is the time to add outdoor seating and dining furniture so let the fun begin. You can select from our Patio shop from a vast array of colors and styles from major manufacture's of quality outdoor products. All available in today's hottest colors and fabrics.